Each year of the project concluded with a major international conference held in Sheffield. These four-day conferences were all open to the public and each resulted in a volume, largely based on the talks at the conference. The three volumes based on the project form a series published as The Innate Mind. Together, the volumes in the series contain nearly 60 new papers on nativist themes from top philosophers, psychologists, and other cognitive scientists, which present a comprehensive overview of contemporary nativist thought and provide the definitive reference point for future nativist enquiry. 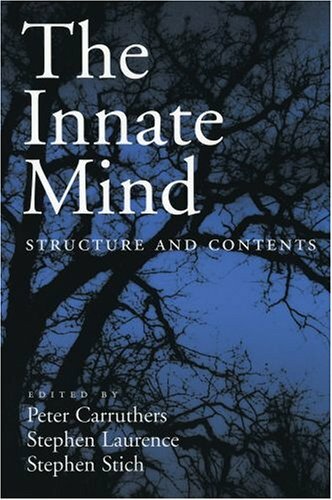 Volume 1 in the series, The Innate Mind: Structure and Contents was published in 2005 by Oxford University Press. 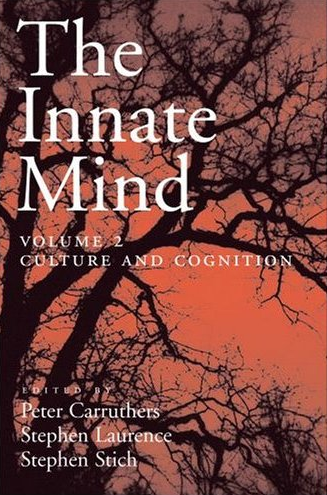 Volume 2 in the series, The Innate Mind: Culture and Cognition was published in 2006 by Oxford University Press. 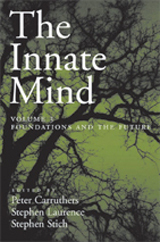 Volume 3 in the series, The Innate Mind: Foundations and the Future was published in 2007 by Oxford University Press.. This is the third and final volume in a set of volumes on the subject of innateness. The extent to which the mind is innate is one of the central questions in the human sciences, with important implications for many surrounding debates. By bringing together the top nativist scholars in philosophy, psychology, and allied disciplines these volumes provide a comprehensive assessment of nativist thought and a definitive reference point for future nativist inquiry. The Innate Mind: Foundations and the Future addresses such questions as: What is innateness? Is it a confused notion? What is at stake in debates between nativists and empiricists? What is the relationship between genes and innateness? How do innate structures and learned information interact to produce adult forms of cognition, e.g. about number, and how does such learning take place? What innate abilities underlie the creative aspect of language use, and of creative cognition generally? What are the innate foundations of human motivation, and of human moral cognition? This is the second volume of a projected three-volume set on the subject of innateness. The extent to which the mind is innate is one of the central questions in the human sciences, with important implications for many surrounding debates. By bringing together the top nativist scholars in philosophy, psychology, and allied disciplines these volumes provide a comprehensive assessment of nativist thought and a definitive reference point for future nativist inquiry. The Innate Mind: Culture and Cognition concerns the interaction of culture and the innate mind, addressing such questions as: To what extent are mature cognitive capacities a reflection of particular cultures and to what extent are they a product of innate elements? How do innate elements interact with culture to achieve mature cognitive capacities? How do minds generate and shape cultures? How are cultures processed by minds? — Shaun Nichols, University of Arizona, and author of Sentimental Rules and co-author of Mindreading. This is the first volume of a projected three-volume set on the subject of innateness. The extent to which the mind is innate is one of the central questions in the human sciences, with important implications for many surrounding debates. By bringing together the top nativist scholars in philosophy, psychology, and allied disciplines these volumes provide a comprehensive assessment of nativist thought and a definitive reference point for future nativist inquiry. The Innate Mind: Structure and Contents concerns the fundamental architecture of the mind, addressing such questions as: What capacities, processes, representations, biases, and connnections are innate? How do these innate elements feed into a story about the development of our mature cognitive capacities, and which of them are shared with other members of the animal kingdom? "This is a terrific collection. It's not just a survey of the terrain, though it is that; it also contains a number of papers that push the boundaries and make major new contributions to several hot debates in cognitive science ...I predict that the book will become a must-have collection, not just for all participants in these fields, but also for those not working in these areas and desiring a comprehensive and accessible guide to the issues." — Fiona Cowie, California Institute of Technology, and author of What's Within: Nativism Reconsidered.